The international press launch for the 993 Turbo was in Marseilles in early 1995. We expected a win-win for Pano on this one: a full-color story on new product, a favorite topic for our readership, and a splashy cover. All at no cost to PCA, since Porsche AG picked up the bill for these events, and economy was important then. Well, we got the story, and it was a good one, full of technical detail. The cover, not so much. I had reserved a car for first-light photography, and got a ladder from the hotel. The concept was to shoot down on the car from above, front to rear, showing those bulging back fenders. It was a yellow car, and I placed it on a bit of grassy meadow with many tiny wildflowers. Should have been gorgeous but it wasn’t; the light was too flat, there were not enough reflections in the paint to add to interest, and it wound up being pretty mundane. The two-page opening spread, on the other hand, was glorious. But it wasn’t my setup. The R & T guy was waiting for me to finish my bad-idea shot, and when I turned the car over to him, he moved it a few feet to a small open area into which the white hotel building reflected fill light from the just-peeping sun. I somewhat guiltily grabbed a three-quarter rear shot with nice reflections in the car and modeling of the dramatic Turbo lines. Learned a lot from that, I did. After the introductory session with Porsche and the early morning photography, we travelled to the circuit at Miramas, long ago a Grand Prix track, owned by BMW and used as a test track. They wisely didn’t let us try to set course records on the banked track, but did treat us to some of those Oh-my-God-at-least-I’ll-die-in good-company laps with Walter Röhrl at the wheel. 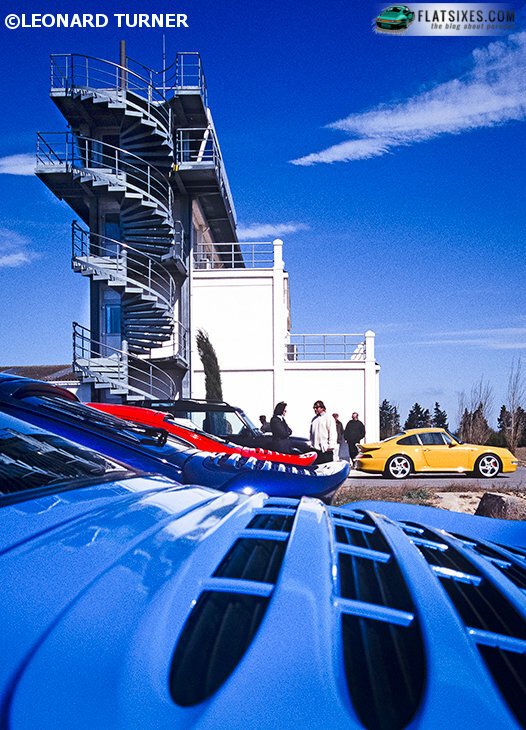 And a chance for more photography, where this column’s image was made, shot over the Daliesque rear spoilers of the cars, control tower of the track in the background, deep polarizer blue sky, etc. Maybe it should have been the cover. We would have had to flip the image to give the right balance for the Panorama logo, but that would have worked. Except that the slanted spokes of those new beautiful new hollow Turbo wheels would have been slanted in the wrong direction and given away the ruse. Oh, well.